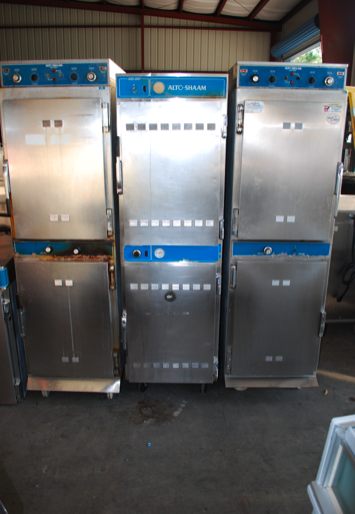 One Fat Frog Restaurant Equipment has a variety of used cook and hold ovens available at discounted prices. many of the used cook and hold ovens at One Fat Frog Restaurant Equipment are made by Alto-Shaam, a truly reliable brand. One Fat Frog Restaurant Equipment’s knowledgeable staff is here to offer some of their insight on cook and hold ovens. Here’s some information about the maintenance requirements and food safety tips for cook and hold ovens. The sturdy construction and generally low-tech nature of these units allows them to last upwards of 20 or 30 years. May manufacturers offer lifetime warranty on the heating element. Many foodservice operators will run these ovens 24 hours a day, seven days a week, only turning them off to clean them. To maintain these units, periodically clean them out following the manufacturers’ suggested procedures and use of chemicals. When the heater cable stops working the unit will need to be replaced. The lowest temperature at which these unites can safely hold food is 142 degrees F. Timers and electric probes can help determine when products are done. In addition, smooth interiors and coved corners prevent grease and food build-up. One Fat Frog Restaurant Equipment can get you financed for all of the used commercial restaurant equipment you need – including used cook and hold ovens. No matter what shape your credit is in, One Fat Frog Restaurant Equipment can get you financed! One Fat Frog Restaurant Equipment also welcomes quick cash deals and package deals towards used cook and hold ovens and the entire stock of used commercial restaurant equipment – so come into One Fat Frog Restaurant Equipment today!